Penn's Fathom Level Wind Conventional Reels deliver all the strength, precision, and run-stopping drag power you need to conquer bottom fishing and other tough situations, backed by a quality 4-bearing system with instant anti-reverse. Full-metal body and sideplates to minimize flex, with a TiN-coated stainless steel levelwind system, marine-grade gearing, three shielded stainless steel ball bearings and patented Versa-Drag with HT-100 washers. "Super Strong compact reel! Awesome reel for fishing with braided line. 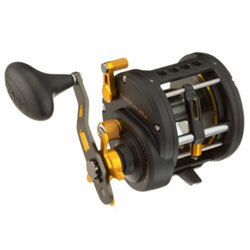 This reel loaded with heavy braid fishies just like a reel twice its size loaded with mono, penn truly held up to there legendary reputation with this pocket size powerhouse!" "I have got the 25LW four days ago and I went fishing for tarpon in Miami and let me tell you it's GREAT reel I put 50Lb power pro braided 300yrds and all around a great reel good for the buck iam going to get more for my boat I recommend this reel to all big game fishermen really fun reel"